The Rexel Momentum X410 Paper Shredder is an ideal shredder for home use. It shreds up to 10 sheets at one time and has a 6 minute continuous run time. Paper is shred into 4x28mm Cross Cut pieces giving this model a high security level of P4. The large 23 litre bin will hold up to 225 sheets of A4 paper and the lift off lid makes the Momentum X410 easy to empty. The X410 easily shreds documents with staples and paper clips attached and comes fitted with anti-jam technology that automatically stops the machine and auto-reverses when too much paper is inserted. The simple, intuitive touch control buttons make the X410 easy to operate and its quiet operation means minimal disruption for users. The X410-SL is a slimmer version of the X410; this slimmer design means that you have more versatility when positioning your shredder. 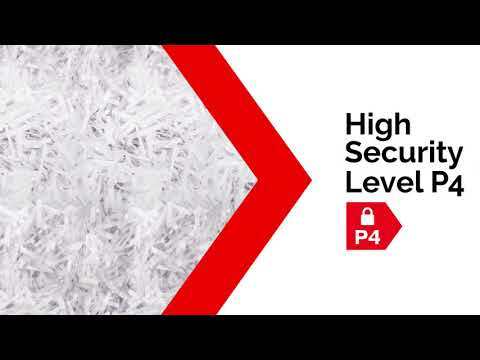 The use of a P-4 shredder such as the Momentum X410-SL Slimline will aid your GDPR compliance.